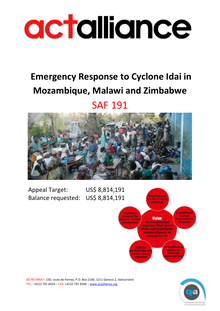 In efforts to address the aftermath of Cyclone Idai, which hit Mozambique, Malawi and Zimbabwe in March, the Economic and Social Council held a special meeting today on the international response, with the Deputy-Secretary General underscoring that additional emergency funding is desperately needed to contain the ongoing crisis and help mitigate similar events in the future. 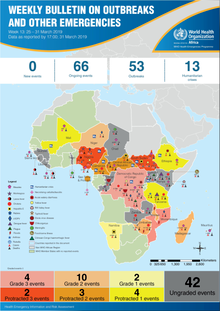 WHO confirmed today, 2 April 2019, the arrival of 884,953 doses of cholera vaccine to support the humanitarian response in Beira, the most affected area hit by the Tropical Cyclone Idai, in Mozambique. The vaccination campaign is expected to start tomorrow, 3 April, and will add to the efforts already in place to control the spread of cholera. • According to the Office for Coordination of Humanitarian Affairs (OCHA), analysis indicates that water levels continue to recede but are not yet below medium flood levels. Waters are, however, still rising in some minor watercourses in the Cheringoma Plateau (in Gorongosa National Park, Sofala province), the Savane, Sangussi and Zambazo, and peaks are forecasted until 2 April. Waters are also receding slowly in the Cuacua River, which flows through the Mopeia District of Zambezia province. The Emergency Telecommunications Cluster (ETC) Services for Communities (S4C) advisor has so far conducted assessments of four community radio stations in Beira, Dondo and Buzi to explore potential S4C projects. 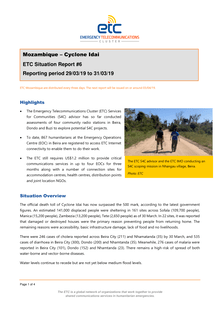 To date,867humanitarians at the Emergency Operations Centre (EOC)in Beira are registered to access ETC Internet connectivity to enable them to do their work. 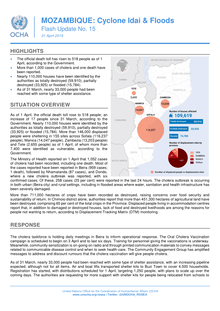 The death toll in Mozambique has risen to 518, as of 1 April. 1 052 cholera cases have also been confirmed in three districts, 959 in Beira (one death), 87 in Nhamatanda and six in Dondo. The cholera vaccination campaign due to start on 3 April will target Beira, Buzi, Nhamatanda and Dondo. 11 cholera treatment centres will manage the response; nine are already operational in Beira and other areas. A freight plane carrying a total of approximately 29 tonnes of supplies is going to be leaving Finland for Mozambique this week. The cargo will include a telecommunications unit and part of a field hospital. Beira, Mozambique —A total of 33,435 Mozambican have now received shelter aid—either tarpaulins to replace destroyed roofs, or full tents—in a concerted international response to devastation brought by Cyclone Idai, one of the worst natural disasters to strike this African nation in decades. Direct Relief commits $250,000 in support of Cyclone Idai response as shipments of critical medicines continue. Flood waters are beginning to recede in Mozambique after Cyclone Idai made landfall last month, but recovery is just beginning for the country, where thousands remain displaced. 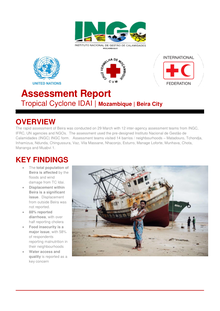 The rapid assessment of Beira was conducted on 29 March with 12 inter-agency assessment teams from INGC, IFRC, UN agencies and NGOs. The assessment used the pre-designed Instituto Nacional de Gestão de Calamidades (INGC) INGC form. Assessment teams visited 14 barrios / neighbourhoods – Matadouro, Tchondja, Inhamizua, Ndunda, Chingussura, Vaz, Vila Massane, Nhaconjo, Esturro, Manage Loforte, Munhava, Chota, Mananga and Muabvi 1. 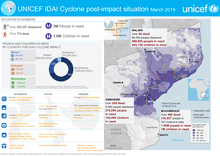 At least 140,784 people have been displaced from Cyclone Idai and the severe flooding. 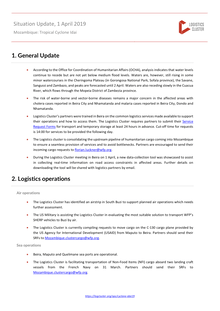 Most of the displaced are hosted in 161 transit centers set up in Sofala, Manica, Zambezia and Tete provinces. 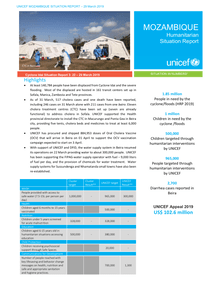 Cholera cases create a new danger for children in the cyclone Idai-ravaged areas of Mozambique. There will be another disaster if cholera spreads. Cyclone Idai, which made landfall in Mozambique over two weeks ago, is one of the worst weather-related catastrophes in Africa in recent times. It left a long trail of death and destruction in Mozambique, Zimbabwe and Malawi, and the flooding and contaminated water caused by the storm pose a huge threat to survivors, including thousands and thousands of children. 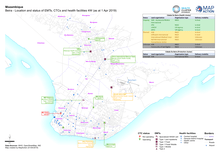 According to UN OCHA, as of 31 March, the death toll stands at 501 people. At least 141 000 are sheltered in 161 sites in Sofala (109 700 people in 116 sites), Manica (15 200 in 27 sites), Zambezia (13 200 in 13 sites) and Tete (13 200 in 5 sites). 55 095 houses have been totally destroyed, 28 129 partially destroyed and 15 784 flooded. Cholera has been confirmed in Beira City; the scale of the damage to water and sanitation infrastructure has raised concerns of risk of further spread. 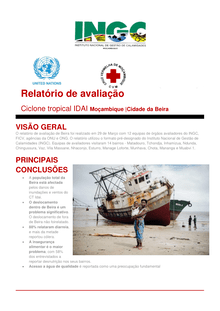 According to the Government of Mozambique, as of 31 March, 501 people are reported dead, 1 523 injured. The total number of people affected is reaching 843 723. The Government of Mozambique confirms 271 cases of Cholera at Munhava health centre in Beira City, but the figures are expected to increase in the coming days. 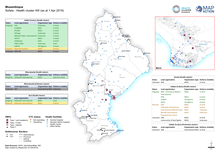 As of 30 March, 11 Cholera treatments centres have been established, of which 7 are already operational (5 in Beira and 2 in other locations).